The Bar at TCR, (formerly the Pint Pot), is a loungy laid back bar that serves great food, beer and wines at very reasonable prices. Late night opening on Thursdays and Fridays and a great 80's party atmosphere make the The Bar at TCR certainly worth a visit. Do you work at The Bar at TCR? Children (under 18) admitted up to 18:00 every day. What did you think of The Bar at TCR? Since being refurbished into The Bar at TCR, what used to be a completely useless pub has changed into a great place for after work drinks. We went there last Friday night and the place was buzzing - good music and for once there were friendly staff. Having been back since for lunch, I can say that the food is distinctly above average and looks like it is made in house, rather than the frozen rubbish that most drinking establishments use. The place is completely non-smoking inside but if you're desperate for a cig there are some comfy chairs outside. Tottenham Court Road sooooo needed a place like this! Rubbish, self-important pub with poor service. This is the type of bar/pub you go to on a Friday night because you can't get in the door anywhere else. When it gets busy the staff cannot cope and turn blatantly rude. Even the managers/owners (not sure who the old geezers are) have no sense of customer service. The lot of them are mongs. It is also a very confused place-since its refurbishment it has tried to be more of a restaurant/cocktail bar but I've never actually seen anyone order one of the cocktails they advertise. They even have fresh roses on the table, but they seem to sell more pissy lager than anything else. The only redeeming factor are the healthy portions of potato wedges. The pizzas are not half bad, but given the crap wine and atmosphere you are better off heading to Charlotte Street to a Pizza Express or Zizzis. What a find - The Bar at TCR was fantastic. A great party atmosphere created by the DJ made for a truly thrilling night out. A bar that lights up your night for all the wrong reasons. 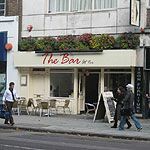 Fitzrovia regulars may remember with fondness The Pint Pot, a small pub on Tottenham Court Road that was great for a cheap pint and a bite to eat. However, that place has now disappeared and in its place sits The Bar @ TCR, a hybrid between an attempt at a swanky bar and a traditional pub. The venue has a central location smack bang in the middle of Tottenham Court Road and is near to many of the media offices in the area. However, despite its key location it hasn’t managed to establish itself as one of the popular drinking holes in the area, and doesn’t seem to have found it’s niche yet. The décor comprises of a garish white exterior with a few tables and chairs outside. Inside the layout is surprisingly large, with a bar running down one side, and a mishmash of tables and chairs. There is a decked smoking area at the back, however to get to this you have to squeeze past some of the tables – perhaps a review of the layout could be an idea. The Bar @ TCR attracts mainly people who work in the surrounding area and non-regulars who happen to walk past and fancy a pint. It doesn’t have that homely welcoming feel of a local, but with minimal housing nearby, it’s probably not aiming for that market anyway. Most of the punters are aged 18-30, and the atmosphere is usually loud and buzzing, especially on Friday nights. Watch out for a shockingly bright selection of disco lights which the staff sometimes turn on around 8pm. It makes you wish you’d brought your sunglasses with you. A varied selection of food is on offer here. On one side of the menu is a selection of pizzas, with favourites such as ham and mushroom pizza or calzone Fiorentina (spinach, eggs and olives) costing £6.95. Turn over the menu and you can find a selection of pub favourites such as homemade beef burger with French fries and salad (£6.95), whilst a tuna Nicoise salad will set you back £7.95. For those after a smaller bite you can get bar snacks such as beer battered onion rings for £3.25. The Bar @ TCR offers a satisfactory yet uninspiring range of drinks. The best value for money deal here is their £4 cocktail of the week, of which you get a choice of three. Beers on draught include Fosters, Strongbow, Kronenbourg and Becks Vier, all priced around the £3.40 a pint mark. This isn’t the place to bring that special someone on a date, nor is it the kind of pub that your mum and dad will enjoy. But it is okay for a quick after work pint. Just bring your shades if you’re allergic to bright lights.